William Perkins invites you to contact TARP, Inc. for more information, including classroom instruction, and distance learning (online) courses for Credentialed Alcoholism and Substance Abuse Counselors (CASAC). 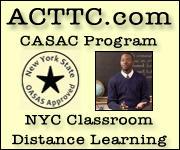 TARP, Inc. is a New York State OASAS Approved Provider and a NAADAC Approved Education Provider. Instructors have a combined 100 years of experience in the treatment and prevention of drug abuse. Thank you for visiting our web site. Please contact us for more information.